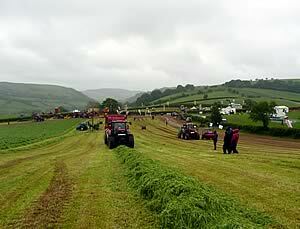 The show rolled on, despite the worst possible combination of wind and rain as the first Royal Welsh Grassland Event got underway. It was Breconshire’s flagship Royal Welsh Show fundraising event, held at the home of its President, John Davies, Pentre, Merthyr Cynog, near Builth Wells. More than a thousand people travelled from all over Wales and beyond to see an impressive range of equipment from each of the main manufacturers. And farmers and operators, undeterred by the atrocious weather conditions, were in good spirits as kit of an impressive size and variety took to the fields - sometimes cutting grass in standing water. "It showed the machines would work in any conditions! So it was a good test from that point. And despite the weather we were reasonably pleased – the organisation by John and his team was excellent." There was a range of advice on offer, from trial plots from British Seed Houses to the latest from Farming Connect and a Speakers’ Forum provided provocative food for thought. Carmarthenshire dairy farmer Howell Richards put up a robust defence of the media’s labelling of his 2000 cow dairy as a ‘super dairy’. He said: "Do you mean by a super dairy that we use less antibiotics than the UK national average, we have less lameness than the national average, our cows live longer than the UK national average, and our welfare standards are higher than the UK national average. If you mean that’s what a super dairy is, then that’s what we are." The Grassland Event’s main sponsor, Meat Promotion Wales, Hybu Cig Cymru, launched two booklets to help farmers further improve the ‘excellent work’ they were already doing, to cut costs of production and produce more forage. The key thing was to manage land effectively and the forage produced on it, both of which were essential for farmers to remain productive and sustainable. HCC’s Technical Development Executive, Lynfa Davies, said: "It’s basically to provide good, practical advice to farmers on best practice on how to make good quality silage. There are the top ten tips on what to be looking out for."